The American Architectural Foundation has donated the original model of the World Trade Center to the September 11th Museum. The Museum has another name but it is ridiculously long and focus-grouped and I refuse to use it. The 7-foot-plus model wonder of the world was constructed by Minoru Yamasaki Associates and has survived because of great care. 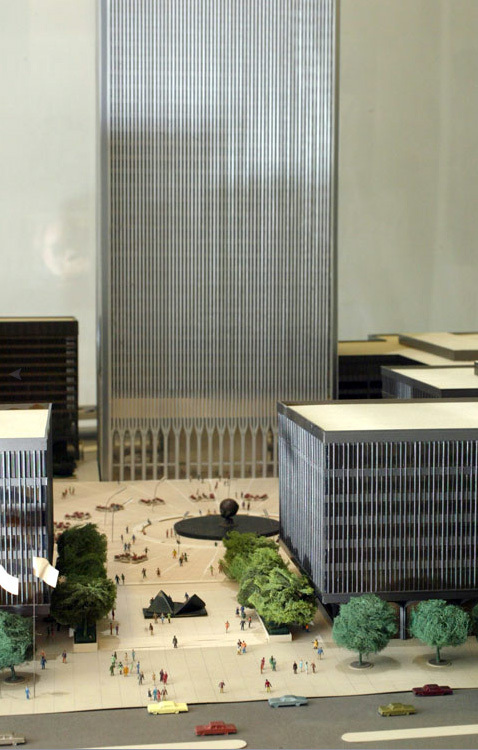 I saw this model in 2004 when it was displayed at the Skyscraper Museum and it's a powerful thing. That museum is close to Ground Zero but a bit off the beaten path in Battery Park City. Visiting during the day I had the model to myself. It was a powerful experience: the model was my new memorial. The model is huge, a technical achievement in its own right, not just in construction but in the extreme stewardship needed to keep it in good shape. And yes, it's significant and ironic that a paper and plastic model outlived a huge building complex. It's a powerful reminder of what was lost seven and a half years ago.